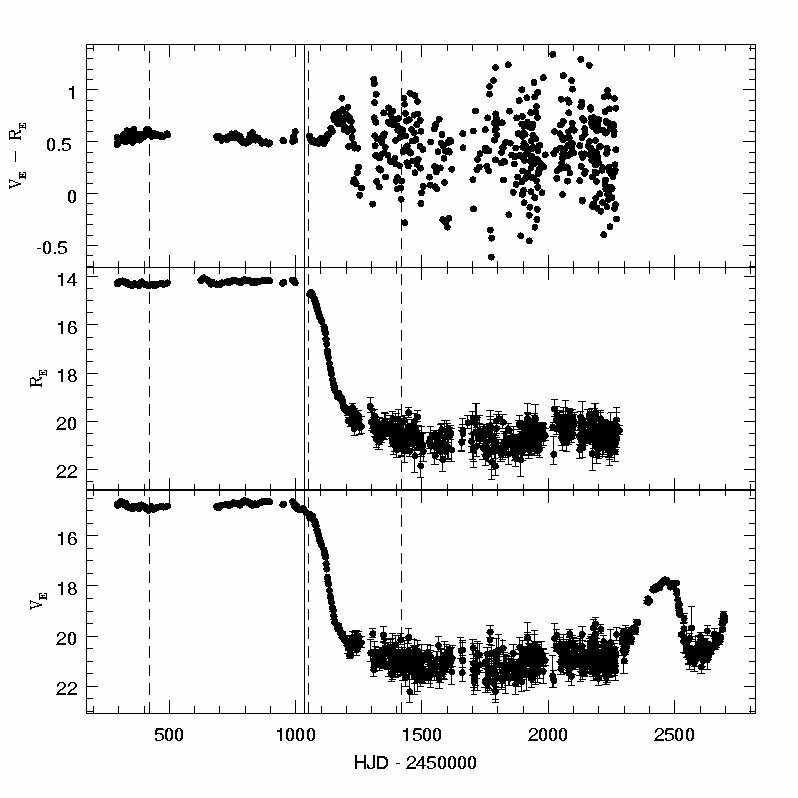 EROS2 (Expérience de Recherche d'Objets Sombres) conducted a survey of the SMC between July 1996 and February 2003 in two non-standard broad photometric passbands. 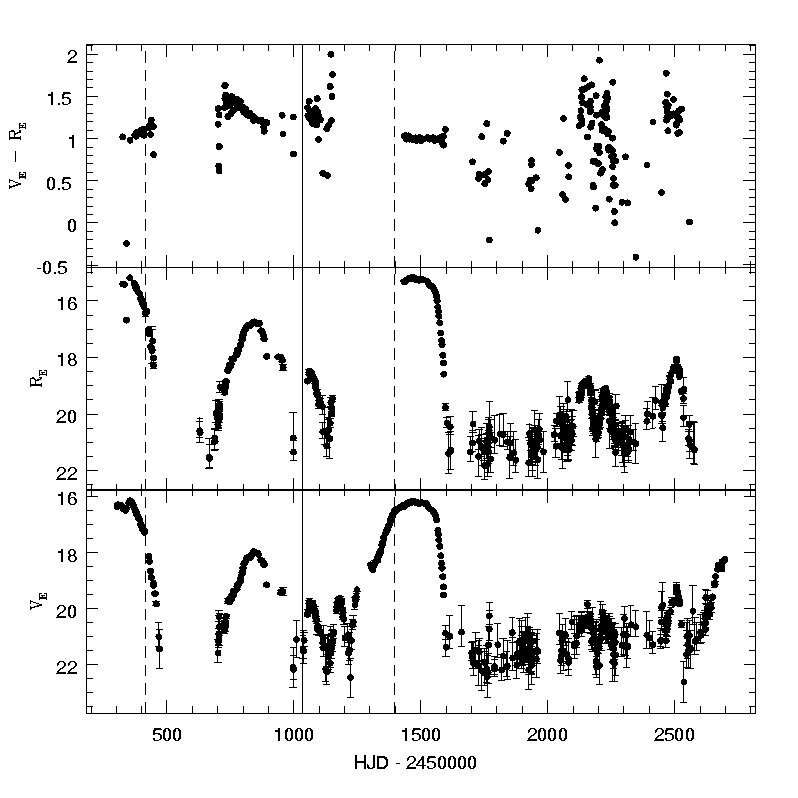 The photometric data of 4.2 million stars have been searched for behavior typical of R Coronae Borealis (RCB) candidates such as drastic changes in magnitude. Five objects have been found, four of them being catalogued in the Simbad database as RAW21, RAW233, RAW476, and [MH95]431 with confirmed carbon-rich atmosphere, characteristics of RCB. 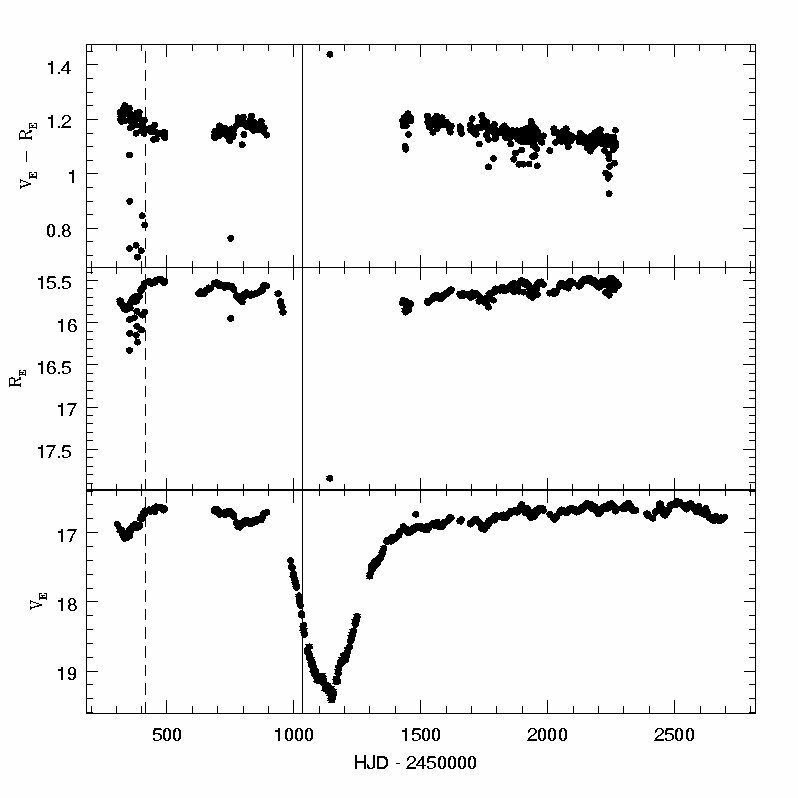 From the EROS2 light curve of RAW21 and its spectrum reported by Morgan et al. (2003), we confirm it is the first RCB in the SMC. The other objects are new RCB candidates with absolute luminosity and colour close to those found for RCB in the LMC. We propose that 2 of them are DY Per-like RCB. Approximate position of the 5 EROS2 RCB stars with the 10 SMC fields observed during 7 years. _The vertical lines on the ligthcurves graphics indicates the epoch of the 2MASS observation (solid lines) and the DENIS ones (dashed lines). _Finding chart = (North-East : Top-Left) of 400*400 pixels with a pixel size of 0.42", the two white lines are 8.4" long. 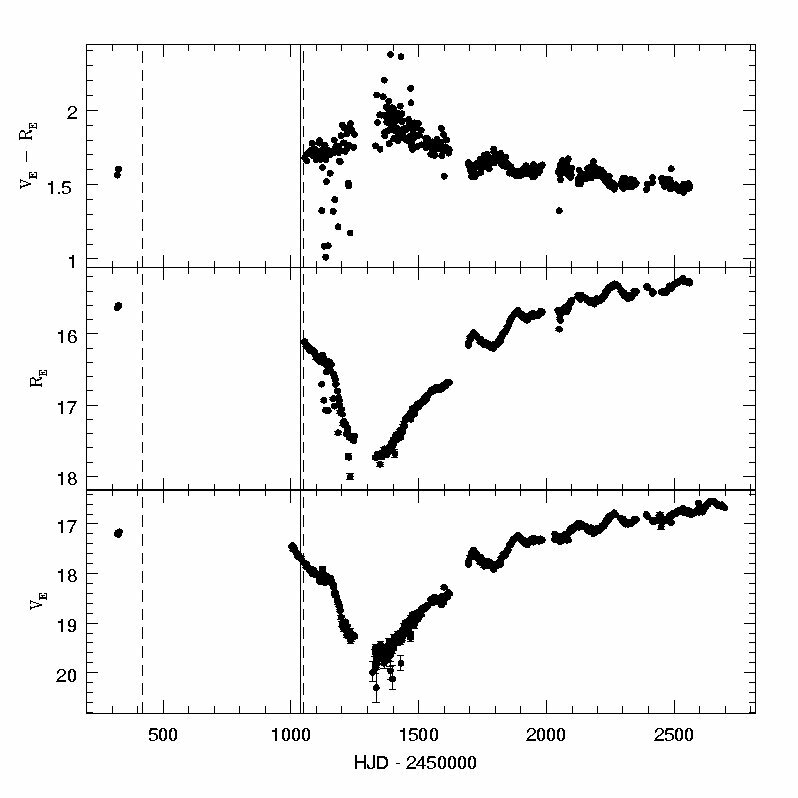 "The R Coronae Borealis stars"
"The R Coronae Borealis stars - I. Infrared photometry and long-term variations"
"The R Coronae Borealis stars - II. 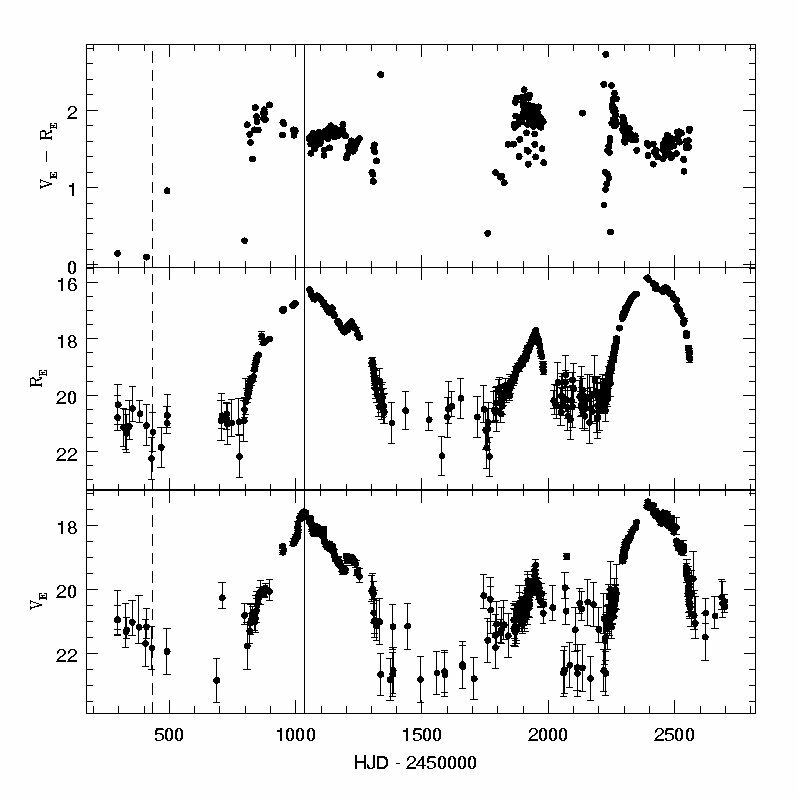 Further inferences from the infrared data"
"The MACHO project LMC variable star inventory. X. 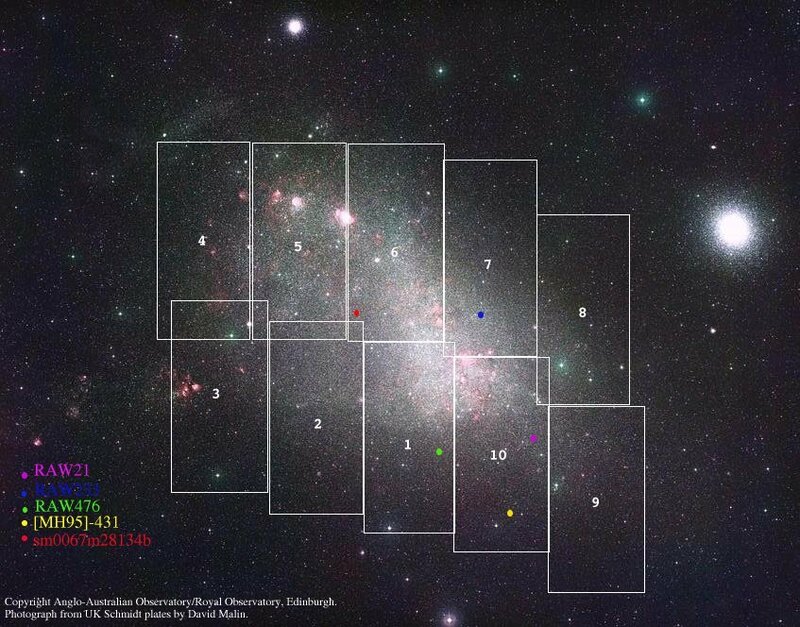 The R Coronae Borealis stars"
"Suspected cool R Coronae Borealis stars in the Magellanic Clouds"
http://morpheus.phys.lsu.edu/~gclayton/mwalker/ : G.C. Clayton's home page with a list of known RCBs (galactic or not). http://star.arm.ac.uk/~csj/research/rcb_review/ : S. Jeffery's home page with some on-line explanations about those stars.